This is a hearty and satisfying meal. In my house, we often pair it with a simple salad. 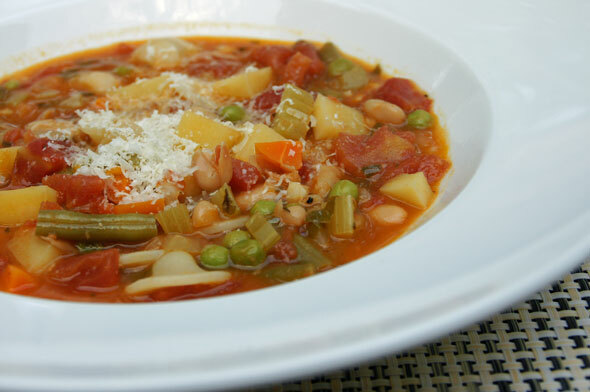 This recipe is a bit more time-consuming than my typical soup but it’s well worth the effort. Wonderful flavors from the tomato paste that gets cooked into the veggies, as well as from the little bit of red pepper flakes and dried spices. You can easily make the dish vegan by using non-egg pasta and omitting the optional shaved parmesan cheese. To a large Dutch oven or stockpot over medium heat, add 3 tablespoons of olive oil. Once the oil is shimmering, add the chopped onion, carrot, celery, tomato paste and a pinch of salt. Cook, stirring often, until the vegetables have softened and the onions are turning translucent, about 7 to 10 minutes. Pour in the diced tomatoes and their juices and broth. Add the salt, bay leaves and red pepper flakes. Season generously with freshly ground black pepper. Raise heat to bring the mixture to a boil, then partially cover the pot with the lid, leaving about a 1” gap for steam to escape. Reduce heat as necessary to maintain a gentle simmer. Cook for about 15 minutes, then add the pasta, beans and greens. Continue simmering, uncovered, for about 20 minutes until the the pasta is al dente and the greens are tender. Remove the pot from the heat, remove the bay leaves and stir in the lemon juice or vinegar and the remaining tablespoon of olive oil. Correct the seasonings as needed with salt and pepper. Garnish bowls of soup with grated Parmesan, if you’d like.